Previous studies have shown complex roles for the B7 receptors in providing both positive and negative regulation of experimental autoimmune encephalomyelitis (EAE). B7 blockade can ameliorate clinical EAE by indirectly interfering with CD28 signaling. However, B7 blockade can also result in disease exacerbation, presumably by interfering with regulatory B7:CTLA-4 interactions. Therefore, we have directly targeted T cell CD28 with specific mAbs both during initial Ag priming and after the onset of clinical signs of EAE. We found that CD28 blockade ameliorated EAE during the efferent and afferent limbs of the immune response. Disease amelioration at disease onset was associated with suppression of TNF-α production. Finally, Ab blockade of T cell CD28 during the first disease episode resulted in significant attenuation of the subsequent disease course, with no significant relapses. In contrast to previous studies targeting APC B7 with CTLA4-Ig, reagents targeting CD28 can block ongoing disease. Therefore, the present results suggest a clinically relevant therapeutic scenario for human diseases, such as multiple sclerosis. Clonal expansion and functional differentiation of T cells require two signals (1). The first is provided by the recognition of the antigenic peptide presented in the context of self-major histocompatibility molecules by the TCR/CD3 complex. The second signal is provided by the interaction of an accessory receptor on the T cell with its ligand on the APC and is referred to as costimulation. TCR occupancy in the absence of costimulation induces anergy or nonresponsiveness (1, 2, 3). Although several different T cell-APC interactions can provide costimulation, the major costimulatory signal appears to be through the CD28 receptor on the T cell (4, 5, 6). The CD28 gene has been disrupted to create a mouse genetically deficient in CD28 (5). Studies using this mouse have demonstrated that some immune responses are dependent on CD28 costimulation (5, 7). However, other immune responses remain either partially or completely intact, suggesting less dependence on costimulation or the significance of other costimulatory pathways, such as the recently described inducible costimulator (5, 8, 9). CTLA-4 (CD152) is also involved in the delivery of a secondary signal that regulates T cell activation. Recent evidence suggests that T cell activation is regulated by competing signals delivered by CD28 and CTLA-4 (10, 11, 12, 13). Blockade of CTLA-4 with specific mAb can exacerbate clinical signs of experimental autoimmune encephalomyelitis (EAE)3 (14, 15). Anti-CTLA-4 injection at the onset of clinical signs resulted in increased production of the proinflammatory cytokines IL-2, IFN-γ, and TNF-α and increased clinical disease severity and mortality (14). The B7 molecules on the APCs, B7-1 (CD80) and B7-2 (CD86), are the counterreceptors for both T cell CD28 and T cell CTLA-4 (16, 17, 18, 19). Although it has been shown that either CD28 or CTLA-4 can bind to both B7-1 and B7-2, increasing evidence suggests that B7-1 and B7-2 may have distinct costimulatory functions (20, 21, 22, 23). We have previously used the soluble receptor CTLA4-Ig to demonstrate a central role for B7-mediated costimulation in EAE induced by active immunization with myelin basic protein (MBP) (21, 24) and by adoptive transfer of MBP-specific lymph node cells (LNC) (21, 25). Those studies demonstrated that B7-mediated costimulation plays an important role during initial immune cell interactions, enhancing proliferation and cytokine production and determining encephalitogenicity. Those studies also demonstrated that the effects of CTLA4-Ig were schedule dependent. CTLA4-Ig administration can result in either suppression or enhancement of clinical disease in at least one active model of EAE (21). The roles of the individual B7 molecules, B7-1 and B7-2, during the initiation of EAE have been investigated by us (21, 24) and others (23, 26). It appears that the effects of anti-B7-1 and anti-B7-2 reagents in vitro and in vivo depend on the model of EAE studied. However, it is clear that anti-B7-1 treatment ameliorates subsequent disease development, whereas anti-B7-2 treatment usually exacerbates disease. Treatment with both anti-B7-1 and anti-B7-2 may either ameliorate or exacerbate disease, depending on how EAE is induced (21, 24). The mechanism of differential regulation of EAE by the B7 molecules involves differential regulation of cytokines. Kuchroo et al. have attributed the effects of repeated injections of Ab to differential regulation of Th1/Th2 differentiation (23). The effects of a single injection of Abs directed against B7-1 and B7-2 involve regulation of the encephalitogenic cytokine TNF-α (24). Blockade of B7-1 using Fab fragments during ongoing EAE prevents epitope spreading and subsequent relapse (26), whereas using the intact mAb exacerbates disease (27). Given the complexity of B7:CD28/CTLA-4 interactions, B7-mediated costimulation is not necessarily equivalent to CD28-mediated costimulation. Indeed, previous studies predict that CTLA4-Ig therapy could prevent B7:CTLA-4 interaction and result in enhanced disease (21). Therefore, direct manipulation of CD28 and CTLA-4 may be preferable to B7 blockade. We have therefore begun to directly target CD28 with mAb Fab fragment in the EAE model. CD28 blockade either during disease induction or after the establishment of clinical disease resulted in disease amelioration. This amelioration was associated with suppressed production of the proencephalitogenic cytokine TNF-α and decreased production of IL-2. Therefore, direct targeting of T cell CD28 is a potential strategy for treatment of autoimmune demyelinating disease. Female (PL × SJL)F1 mice were obtained from The Jackson Laboratory (Bar Harbor, ME). All (PL × SJL)F1 mice were 10 to 12 weeks of age when experiments were initiated. Transgenic mice bearing the Vβ8.2, Vα2.3 TCR specific for MBP Ac1–11 on the B10.PL background were provided by Dr. Joan Goverman (University of Washington, Seattle, WA). These mice were bred and maintained in our animal colony in compliance with the Animal Studies Committee (28, 29). In conducting this research, the investigators adhered to the Guide for Laboratory Animal Facilities and Care as promulgated by the Committee on the Guide for Laboratory Animal Resources (National Academy of Sciences, National Research Council, Department of Health and Human Services, Publication No. (NIH) 86-23). Whole MBP was prepared from guinea pig spinal cords (Rockland, Gilbertsville, PA) as previously described (30). Hamster anti-mouse CD28 hybridoma 37–51 was kindly provided by Dr. James P. Allison (University of California, Berkeley) (31), and mAb was purified from tissue culture supernatant. Hamster anti-mouse CD28 mAb PV-1 (32) was purified from tissue culture supernatant also. Control hamster IgG was purchased from Rockland. 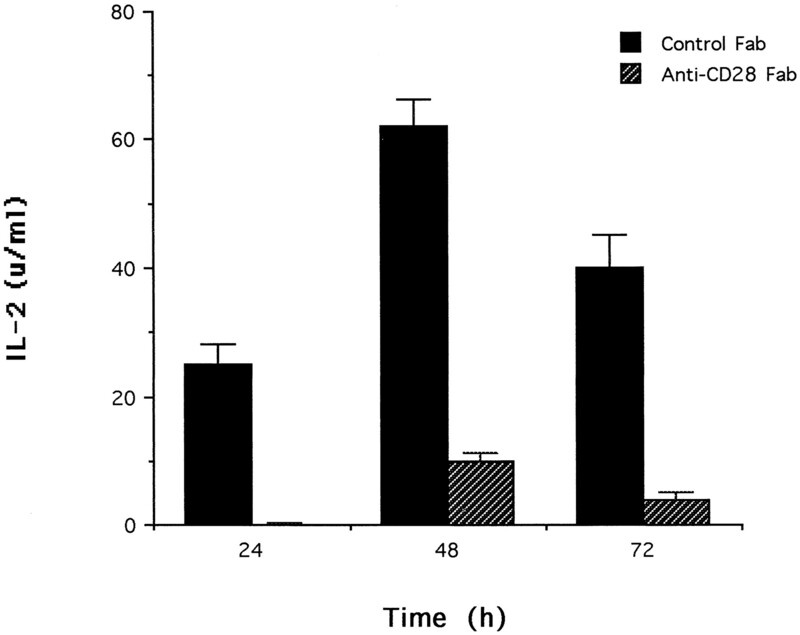 The endotoxin content of the Abs used in these studies was <0.4 EU/mg. Fab fragments were made using the ImmunoPure Fab Kit (Pierce, Rockford, IL) according to the manufacturer’s instructions. The Fab fragments were subsequently run on a 12% SDS-PAGE gel under nonreducing conditions with m.w. markers and whole Abs. Gels were stained with Coomassie blue, and purity was assessed. For actively induced EAE, mice were immunized by s.c. injection of 400 μg MBP emulsified in CFA (Difco Laboratories, Detroit, MI) above the shoulders and flanks and i.p. injection of 100 ng pertussis toxin (List Biological Laboratories, Campbell, CA) on days 0 and 2. Animals were examined daily for signs of disease and graded as previously described (33): 0, no abnormality; 1, flaccid tail; 2, moderate hind limb weakness; 3, severe hind limb weakness; 4, complete hind limb weakness; and 5, quadriplegia or premoribund state. For adoptively transferred EAE, mice were immunized with MBP (400 μg) in CFA, and 10 days later draining lymph nodes were removed. MBP-specific LNC (4 × 106) were cultured in 2 ml of RPMI 1640 (BioWhittaker, Walkersville, MD) supplemented with 10% FBS, penicillin G (100 U/ml), glutamine (2 mM), nonessential amino acids, HEPES buffer, 2-ME (5 × 10−5 M), and MBP (25 μg/ml) for 3 days in 24-well plates (Costar, Corning, NY). LNC were washed and adjusted to the required concentration in PBS so that each recipient received 3 × 107 cells in a 0.2-ml suspension via the tail vein. Recipient mice were observed daily for signs of disease, as above. For adoptively transferred EAE using transgenic T cells with a TCR specific for MBP1–11, splenocytes from transgenic mice were cultured 1:5 with wild-type splenocytes from B10.PL mice at a final concentration of 4 × 106 cells/ml in medium as described above with MBP (25 μg/ml) for 48 h. After 48 h, T cells were washed and adjusted to the required concentration so that each naïve B10.PL recipient received 2 × 107 cells in a 0.2-ml suspension i.p. Recipient mice were observed daily for clinical signs of disease as above. TNF-α was assayed with the Endogen (Cambridge, MA) ELISA kit according to the manufacturer’s instructions. An IL-2-dependent cell line, CTLL.EV (34), was generously provided by Dr. W. Paul (National Institute of Allergy and Infectious Diseases, National Institutes of Health, Bethesda, MD). Supernatants (50 μl) from experimental cell cultures were assayed in quadruplicate. Results were compared, with proliferation of the cell line to known amounts of IL-2 as standards. SD of replicate cultures was <10% of the mean (21, 25). Treatment effects were assessed with the Mann-Whitney sum of ranks test. Differences in disease incidence were analyzed using Fisher’s exact test. Differences in TNF-α release by ELISA were analyzed with the Student’s t test. We have previously shown that in vitro blockade of B7 reduces the ability of MBP-primed cells to transfer EAE (21, 25). In addition to its negative effects on T cell activation, CTLA-4 can also provide costimulation for some T cell responses (35, 36, 37). Previous experiments with injection of anti-CD28 Abs have shown effects that are consistent with induction of both agonistic and antagonistic effects (38). Therefore, we used anti-CD28 Fab (mAb PV-1) to specifically block B7:CD28 interaction during EAE, as anti-CD28 Fab fragments do not induce signal transduction and yet remain capable of efficient blockade of B7 binding. Mice were immunized with MBP (400 μg) in CFA, and 10 days later draining lymph nodes were removed and cultured in the presence or absence of CD28 blockade. As shown in Fig. 1⇓, in vitro activation of MBP-primed cells in the presence of anti-CD28 Fab fragments resulted in both lower disease incidence and decreased disease severity in animals developing clinical disease. 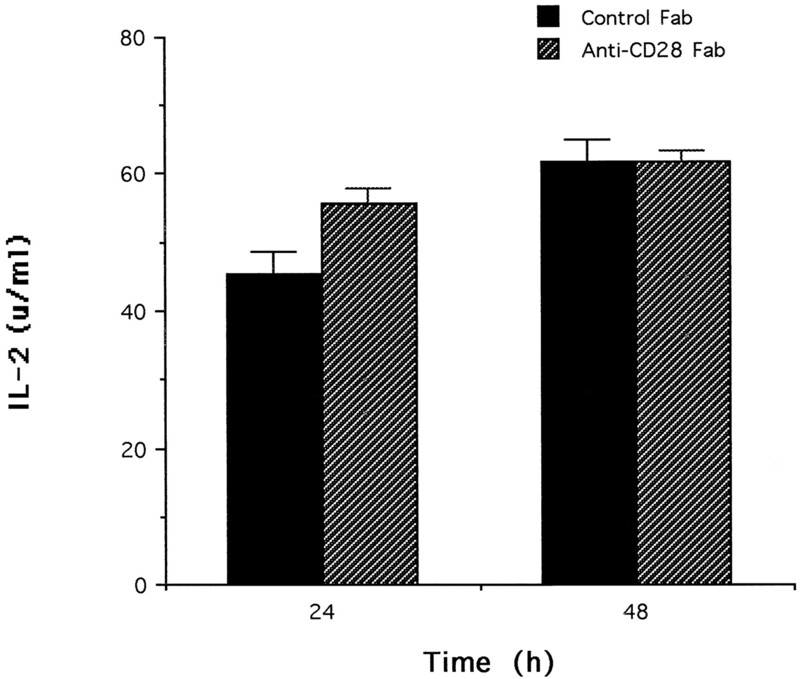 In addition, the presence of anti-CD28 Fab resulted in a dramatic reduction in IL-2 production (Fig. 2⇓), consistent with the known role of the B7-CD28 pathway in the production of this cytokine (39). These results demonstrate in the adoptive transfer model of EAE that encephalitogenic T cells require a costimulatory signal, delivered through CD28, to mediate significant disease-producing capability and secretion of inflammatory cytokines. CD28 blockade suppresses the ability of MBP-primed cells to transfer EAE. A, LNC from (PL × SJL)F1 mice obtained 10 days after immunization with MBP/CFA were cultured with 25 μg/ml MBP in the presence of either 5 μg/ml PV-1 (anti-CD28) Fab (six mice) or 5 μg/ml control hamster Fab (seven mice). Cells (30 × 106) were injected into naïve recipients on day 0, and the clinical disease severity was assessed. The incidence of disease in animals receiving the cells pretreated with the anti-CD28 Fab was lower than that of the control animals (p = 0.01), and the severity of disease from the time of disease onset until the end of the observation period (days 6 to 38) was reduced (Mann-Whitney sum of ranks, p < 0.01). B, LNC were cultured in the presence of either 10 μg/ml PV-1 Fab (five mice) or 10 μg/ml control hamster Fab (five mice). The severity of disease from the time of disease onset until the end of the observation period (days 8–36) was reduced in the animals receiving the cells pretreated with the anti-CD28 Fab (Mann-Whitney sum of ranks, p < 0.01). CD28 blockade suppresses IL-2 production by MBP-primed T cells. MBP-specific LNC were stimulated with 25 μg/ml MBP in the presence of 5 μg/ml of either PV-1 (anti-CD28) Fab or hamster IgG Fab. Supernatants were harvested after 24, 48, and 72 h. IL-2 was measured using the IL-2-dependent cell line, CTLL.EV. Isobars represent SEM. IL-2 production was significantly suppressed by CD28 blockade (Student’s t test, p < 0.05). Cells cultured in the absence of additional MBP did not produce detectable IL-2 (data not shown). 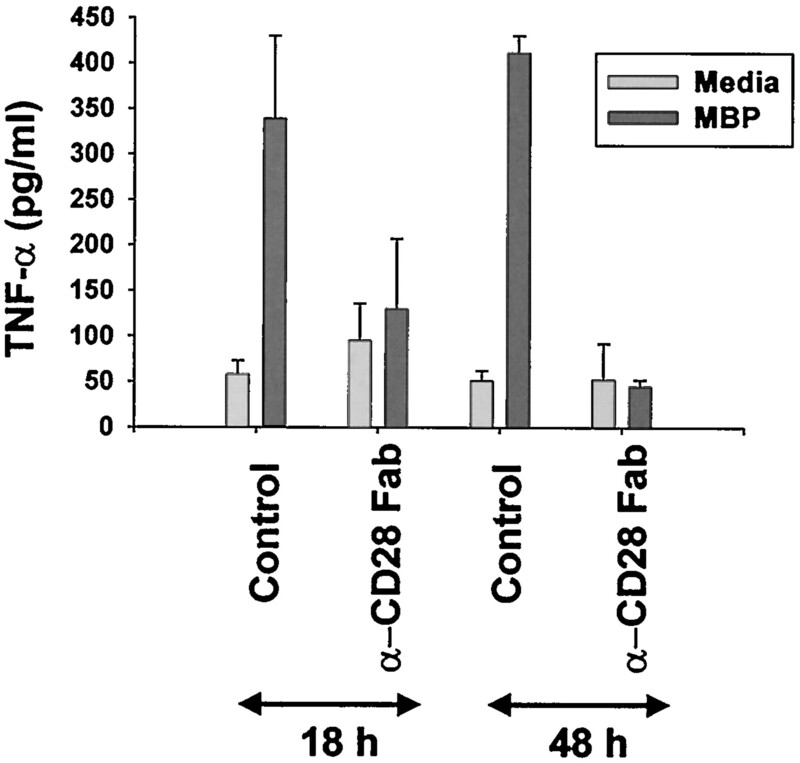 Similar results were obtained in experiments using 10 μg/ml anti-CD28 Fab. Because CD28 blockade suppressed pathogenicity of previously primed cells, we next assessed the role of CD28 during Ag priming in vivo. Animals were injected with 50 μg anti-CD28 Fab or hamster IgG Fab i.p. on days 2 and 4 after immunization with MBP. Although 5 of 5 animals in each group developed EAE, anti-CD28 Fab recipients developed a less severe disease (Fig. 3⇓). The effect of anti-CD28 Fab injection lasted for the duration of the observation period (73 days). Thus, in the active model of EAE, a transient interruption of CD28 function results in long-term amelioration of clinical disease activity. Anti-CD28 Fab injection suppresses the development of EAE. (PL × SJL)F1 mice were immunized with MBP/CFA and received pertussis toxin on days 0 and 2. Animals received i.p. injections of either 50 μg anti-CD28 Fab or 50 μg control hamster IgG Fab on days 2 and 4 (n = 5). Animals receiving the anti-CD28 Fab underwent a less severe disease than that of controls after the onset of disease until the end of the observation period (Mann-Whitney sum of ranks, p < 0.01). The above results suggested that the likely mechanism of inhibition of disease was that encephalitogenic CD4+ precursors failed to produce adequate IL-2 and expand sufficiently during CD28 blockade to reach the threshold necessary to cause disease. To address whether the effect of anti-CD28 merely reflected an inhibition of expansion of encephalitogenic precursors, MBP-specific TCR transgenic T cells were cultured at a very high precursor frequency in vitro with MBP and anti-CD28 blockade. Under these conditions, significant differences in the ability to induce EAE were not noted (Table I⇓). In addition, no differences in IL-2, IL-4, or IFN-γ production in tissue culture supernatants were noted at 24 or 48 h after initiation of culture of these cells with Ag. (Fig. 4⇓ and data not shown). These results, plus the ability of anti-CD28 to have such a long-lasting effect during Ag priming, strongly suggest that the effect mediated by anti-CD28 Fab in this model is due to inhibition of expansion of CD4+ encephalitogenic precursors that mediate EAE. CD28 blockade does not suppress IL-2 production by MBP-specific TCR transgenic T cells cultured at a high precursor frequency. MBP-specific TCR transgenic T cells were stimulated with MBP (25 μg/ml) in the presence of either PV-1 (anti-CD28) Fab or hamster IgG Fab (10 μg/ml). Supernatants were harvested at 24 and 48 h. IL-2 was measured using the IL-2-dependent cell line CTLL.EV. Isobars represent SEM. CD28 blockade did not affect IL-2 production by the transgenic T cells (Student’s t test, p > 0.05). Cells cultured in the absence of exogenous MBP did not produce detectable IL-2. Most studies of B7-mediated costimulation have focused on the initial immune cell interactions during Ag priming. While administration of anti-B7-1 Fab fragment can suppress established EAE (26), CTLA4-Ig injection does not alter established disease (25, 40). We therefore evaluated the ability of specific CD28 blockade to suppress EAE in the direct model after completion of initial Ag priming. As shown in Table II⇓, anti-CD28 Fab injection just before disease onset can ameliorate disease. 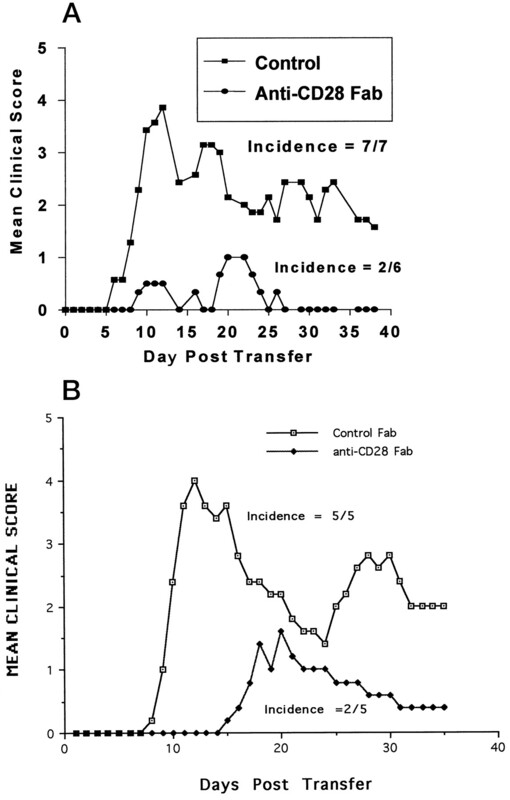 In the experiment illustrated in Table II⇑, we delayed injection of anti-CD28 Fab or control hamster Fab until after the first mice displayed clinical signs. Animals then received 10 μg of anti-CD28 Fab or control hamster Fab every other day for 14 days beginning the day after the first animal displayed clinical disease signs. 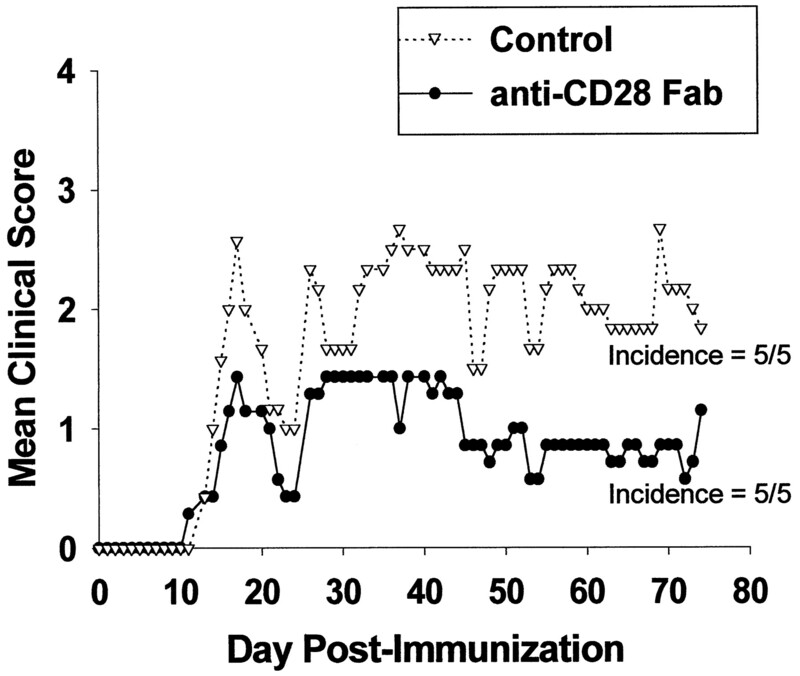 In this experiment, none of the anti-CD28 Fab recipients developed disease for 21 days. After the initial 21 days, the severity of disease eventually developed by the anti-CD28 Fab recipients was less severe than that developed by the control mice. These results demonstrate that blockade of B7:CD28 interactions just before the onset of disease can inhibit clinical signs of EAE. These results were surprising in that previous studies have shown that effector cells are relatively independent of costimulation. We next assessed the effect of CD28 on the production of TNF-α, an important proinflammatory mediator of autoimmune demyelination (41). Animals were injected i.p. with 10 μg of anti-CD28 Fab or control hamster Fab every other day for 14 days beginning the day after the first animal displayed clinical disease signs. LNC were obtained 7 days after the final injection and were cultured in the presence or absence of MBP. TNF-α release into culture supernatants was assessed by ELISA. As shown in Fig. 5⇓, CD28 blockade significantly reduced TNF-α secretion. Anti-CD28 Fab injection at the onset of clinical EAE suppresses TNF-α production. Animals were immunized and injected with PV-1 (anti-CD28) Fab or control hamster Fab as in the experiment shown in Table I⇑. Animals were sacrificed 1 wk after the final injection, draining lymph nodes were obtained, and single-cell suspensions were prepared. LNC from individual animals (n ≥ 3) were cultured in the presence of medium or MBP. TNF-α production by cells derived from PV-1 Fab-treated mice was suppressed (Student’s t test, p < 0.05). Supernatants were harvested and assessed by ELISA. Isobars represent 2 SEM. Finally, we asked whether CD28 blockade, after the establishment of clinical disease, could attenuate the course of clinical EAE. We immunized (PL × SJL)F1 mice and allowed them to develop EAE. After all of the mice had signs of EAE for at least 2 consecutive days, they were divided into two groups and injected with 10 μg of either anti-CD28 mAb 37–51 or control hamster IgG every other day. 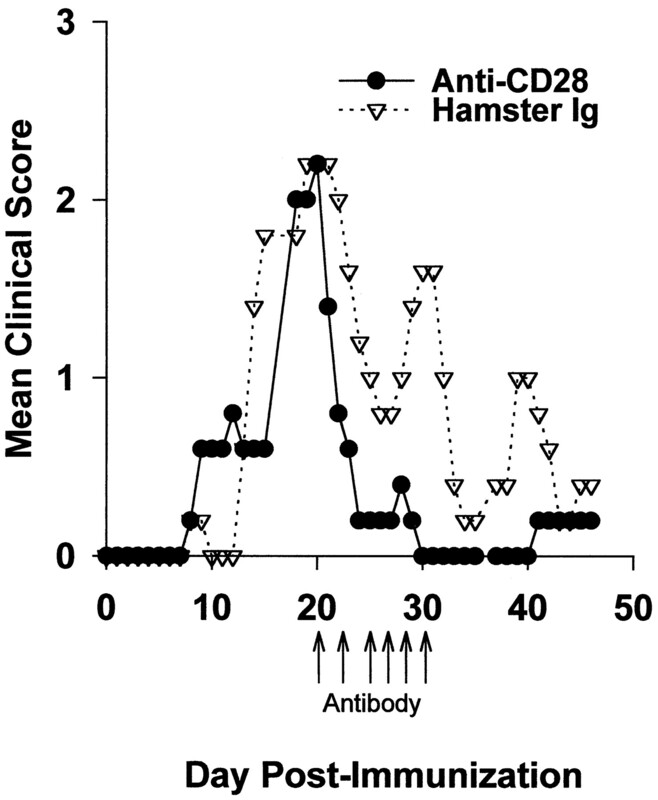 The mean maximal score achieved by both groups of mice before injection was 2.8. Each animal received six injections between days 20 and 30 postimmunization. As shown in Fig. 6⇓, anti-CD28 injection resulted in an attenuated disease course. The control group of animals had two episodes of relapsing disease, whereas the mice given CD28 blockade did not develop disease exacerbations. The therapeutic effect of CD28 blockade continued after the last injection until the end of the observation period on day 46 postimmunization. These results suggest that direct blockade of T cell CD28 represents a potential therapeutic approach for ongoing autoimmune demyelination. CD28 blockade after the onset of EAE ameliorates established clinical disease. (PL × SJL)F1 mice were immunized with MBP/CFA and received pertussis toxin on days 0 and 2. Animals received i.p. injections every other day of either 10 μg anti-CD28 mAb 37–51 or 10 μg hamster IgG beginning on day 20, when all of the mice (n = 5) had clinical signs of EAE for at least 2 consecutive days. Each animal received six injections. Arrows indicate the days on which Ab was injected. Animals that received anti-CD28 underwent an attenuated disease course after the commencement of injections. Differences in groups were compared for the period of observation following the first anti-CD28 injection (days 20–45; Mann-Whitney sum of ranks, p < 0.01). Previous studies examining the role of the B7:CD28/CTLA-4 pathway have used reagents directed against the B7 molecules (21, 23, 25, 26, 27, 42) or CTLA-4 (14, 15, 43). In these studies, we specifically targeted T cell CD28 to avoid interfering with regulatory B7-mediated interactions with the CTLA-4 molecule. We blocked CD28 during both the expansion of encephalitogenic T cells in vitro and the effector phase of the disease in vivo and found this approach feasible as a treatment of an ongoing, organ-specific autoimmune process. The interactions involving B7-1 and B7-2 with either CD28 or CTLA-4 during EAE and other autoimmune disorders, such as diabetes, are complex. Accessory signals delivered through the B7 receptors can either provoke or prevent clinical EAE (14, 21, 24, 25, 26). Injection of anti-B7-1 Ab suppresses the induction of EAE (24), and anti-B7-2 injection exacerbates clinical disease (21, 23, 24). Conversely, in the NOD mouse model of autoimmune diabetes, anti-B7-2 administration was protective and anti-B7-1 administration exacerbated disease (20). Therefore, the contribution of the individual B7 molecules is dependent on the disease model as well as on the timing of administration of the various reagents. Studies in which B7-1 and B7-2 are blocked simultaneously suggest further complications to approaches that target both B7-1 and B7-2. Injection of both anti-B7-1 and anti-B7-2 can either ameliorate (21) or exacerbate EAE (24), depending on the immunization protocol used for inducing EAE. In one model of EAE, CTLA4-Ig, which binds to both B7-1 and B7-2, can either suppress or enhance clinical disease, depending on the injection protocol used (21). Therefore, it appears that blockade of the B7 ligands during periods when CTLA-4 regulatory interactions may predominate exacerbates autoimmunity. Although the dynamics of B7:CD28 and B7:CTLA-4 interactions might be defined in murine models of EAE, they may be more difficult to predict in patients undergoing less defined disease courses. Therefore, directly targeting CD28 costimulation represents an attractive alternative approach. In the present studies, anti-CD28 Fab injection, either during Ag priming or later, before disease onset, significantly ameliorated EAE. This amelioration was associated with ablated TNF-α production. TNF-α has been associated with encephalitogenicity (41, 44, 45). T cell infiltration into the CNS, together with TNF-α blockade, results in the inhibition of clinical signs of EAE (45). On the other hand, recent studies have shown that EAE can be induced in mice deficient in lymphotoxin-α and TNF-α, suggesting that other cytokines can replace their central pathogenic role in EAE (46). Most importantly, CD28 blockade using a blocking mAb attenuated established EAE. Mice receiving intact anti-CD28 mAb 37–51 underwent attenuated clinical disease and did not undergo significant subsequent relapses. Disease attenuation was also evident after the cessation of treatment, suggesting that short-term CD28 blockade may be sufficient to control expansion or effector functions of autoreactive effector T cells and thereby ameliorate the autoimmune response. The ability of CD28 blockade to ameliorate established EAE is consistent with the ability of B7-1 Fab to prevent epitope spreading and relapse (26). Conversely, CTLA4-Ig has not been effective at blocking ongoing EAE (25), even when using a homologous construct with the murine CTLA-4 extracellular domain (P. J. Perrin and C. H. June, unpublished observations). The present results, together with those of Miller et al. (26), suggest that CD28-targeted therapy may be a useful approach to autoimmune demyelinating diseases. It is important to note that, although the encephalitogenic response is reduced, it is not completely eliminated, suggesting that encephalitogenic T cells, which may not be dependent on CD28, mediated costimulation. This observation would be consistent with recent findings in mice deficient in CD28. In an autoimmune myocarditis model, CD28−/− mice developed autoimmune heart disease, although it was less severe than that observed in heterozygous littermates (47). In addition, breeding NOD mice to CD28−/− exacerbated autoimmunity, suggesting that CD28 plays an important regulatory role in that disease model (48). However, the ability to suppress the ongoing immune response suggests that preactivated T cells may be, at least partially, dependent on T cell costimulation. Alternatively, CD28 blockade may prevent the further recruitment and activation of naïve T cells and interfere with the process known as epitope spreading (26, 49). Collectively, our studies and those of others using CD28 Fab or other B7:CD28 antagonists in wild-type mice would suggest that the effect is primarily mediated by inhibiting the expansion of MBP-reactive T cells that mediate the effect resulting in clinical signs of disease (21, 24, 25, 26). However, it is interesting that when the encephalitogenic T cells are cultured at a very high precursor frequency in vitro, as was the case when we used the MBP-specific TCR transgenic T cells, the anti-CD28 blockade was ineffective in blocking EAE or IL-2 production (Table I⇑ and Fig. 4⇑). It is possible that at high Ag-specific T cell precursor frequency, inability to block all B7:CD28 interactions results in IL-2 production, which then overcomes the result of the blockade, which is otherwise effective when the Ag-specific cells are at a low precursor frequency, as may be the case in wild-type mice. In addition, it is possible that B7 expression on the activated T cells themselves, particularly at high T cell precursor frequency, may be able to provide an additional costimulatory signal. However, B7 expression on T cells may also regulate the immune response in the setting of a high density of responder T cells. The presence of anti-B7-1 and anti-B7-2 Abs augments T lymphocyte proliferation in the presence of optimal stimulation by anti-CD28 Abs, suggesting that B7:CTLA-4 interactions may mediate inhibitory signals (50). Although the data presented in this article suggest that the major effect of CD28 blockade is to reduce the expansion of encephalitogenic precursors, recent data published by our group suggest the possibility that CD28 blockade can produce qualitative effects on the ability to induce inflammation in the CNS. Although CD28+/+ C57BL/6 mice develop EAE in response to myelin/oligodendrocyte glycoprotein immunization, CD28−/− mice develop experimental autoimmune meningitis (51). Experimental autoimmune meningitis is characterized by a polymorphonuclear neutrophil-dominated inflammatory response within the leptomeninges in the absence of classical perivascular infiltrates in the CNS characteristic of EAE. Thus, CD28 signaling may be important for T cells to be able to enter the CNS and induce encephalomyelitis, rather than merely meningitis. However, the present study demonstrates that interruption of the costimulatory signal delivered to encephalitogenic T cells through CD28 can result in inhibition of their expansion and important long-term clinical effects in an organ-specific model of autoimmunity. Ag-specific tolerance is a goal for the treatment of autoimmune diseases. This could be accomplished by preventing the costimulatory signal, without interfering with presentation of Ag to the TCR. Furthermore, because activated cells are targeted with this strategy, the autoantigen does not need to be defined. This is particularly important when considering treatments for diseases such as multiple sclerosis, in which an immune-mediated process is very likely but the identity of the autoantigen unknown (52). In conclusion, previous studies have examined the complex and varying roles of B7-mediated costimulation using reagents specific for the B7 molecules and/or CTLA-4. CTLA4-Ig or B7 Abs could potentially interfere with B7:CTLA-4 interactions that are important for regulation of an immune response. Regulation of the CD28 signal represents a more direct approach to targeting the T cells that mediate EAE than does manipulation of B7. These studies establish the feasibility of this strategy. ↵1 This work was supported by National Institute of Allergy and Infectious Diseases Grant R29-AI43296 and National Multiple Sclerosis Society Grant RG2873A1. M.K.R. is a Harry Weaver Neuroscience Scholar of the National Multiple Sclerosis Society and has been named Young Investigator in Multiple Sclerosis by the American Academy of Neurology Education and Research Foundation; he is supported by National Institutes of Health Grant RO1-NS-37513. The views expressed in this article are those of the authors and do not reflect the official position of the Department of the Navy, Department of Defense, or U.S. Government. ↵3 Abbreviations used in this paper: EAE, experimental autoimmune encephalomyelitis; MBP, myelin basic protein; LNC, lymph node cells.